Here's a collection of PC Software I trust to get your live on Twitch with your gameplay, alerts, webcam, etc. If you're looking for your stream key on Twitch, click here. Probably the easiest and least complicated way to get your stream setup, from PC to Twitch. It uses the least about of CPU to make sure your gameplay doesn't lag while streaming. 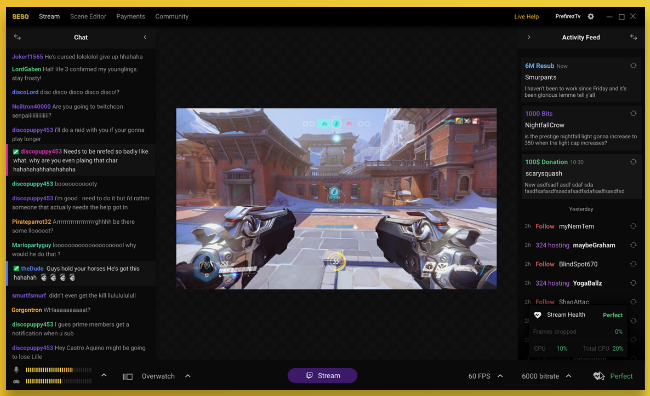 Also, it has everything you need to look at on one page: Twitch Chat, Dashboard, and Logs. The classic. Open source and very flexible when streaming to Twitch. It doesn't have all the hand-holding you'd like for a first-time streamer, but with the right homework, it will do wonders. The original all-in-one streaming client to Twitch. Its UI is my favorite, allowing you to edit quickly and arrange all your sources with ease. My capture device of choice right now. Without it needing drivers to be installed, it's pure plug and play. Just make sure you disable HDCP and you can pull in your favorite console in 1080p60. Nifty combo cam. Has a light to brighten your face and plug & plays on your Windows PC. TBD - Know a product you'd suggest here? Shoot me a DM to feature here!